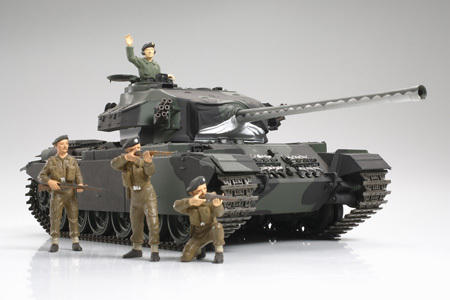 1/25 British Centurion Model Tank Kit Discounts Apply ! TAM30614 - 1/25 British Centurion Model Tank Kit. In celebration of the 40th Year Anniversary of Military Miniatures Tamiya is proud to rerelease the assembly kit static display model of the 1/25 British Centurion. This tank was first released in 1972 and was the first 1/25 scale R/C tank for Tamiya, and was later produced as a full interior display kit. That display kit was produced with the engine which was omitted from the Tiger I (Item 30611) kit of that time. The Centurion contained approximately 100 interior parts making it a hobby for adults. Two crewmen and three soldiers were included in the set. The drivers seat was produced just like the real tank as the seats height was adjustable allowing the drivers head to be seen looking out of the tank. The British Centurion model tank kit display box art was emphasized on an all white package, and a cut model was used in magazines and advertising. Tamiya 30614. Discontinued Item by Tamiya.